A Webpage about cook-type Clearjel, the one used in the USDA recipe for canned pie fillings. I wish to make cherry pie fillings to can, and have purchased the cook-type Clearjel (aka: ClearJel, Clear Jel, CLEARJEL). Clearjel in the NCHFP pie filling recipes makes an extremely thick pie filling; some would call it gloppy, over thickened. It is all right for me, but it is a definite change in texture from what I usually get making fresh pies. I think a thickened but not quite so stand-up pie filling would be nice. So to accomplish the thinner pie filling "thang," the hunt was on. After several searches varying words and phrases, the page "Clearjel Starch Thickener" was found on Healthy Canning. What a great page. It is written by a Randal Oulton, from Canada. Mr. Oulton relies on approved information and recipes from the NCHFP, various USA State Universities for recipes/instructions. "Clearjel Starch Thickener" has nice depth; he cites sources extensively. It appears that he periodically reviews and makes revisions to his article as there were several dates in 2017 for accessing articles and the last date I found was November of 2017. I cannot speak for the rest of his site, but a nice job was done on this page and it answered my questions. Very interesting. This is a great continuing education article for us all. And one last thing: always rely on and teach from approved sources, of course! 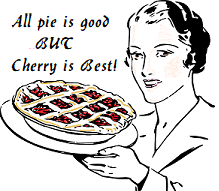 --And I hope to encourage you to make pie filling, can pie filling, make pies and eat PIES!